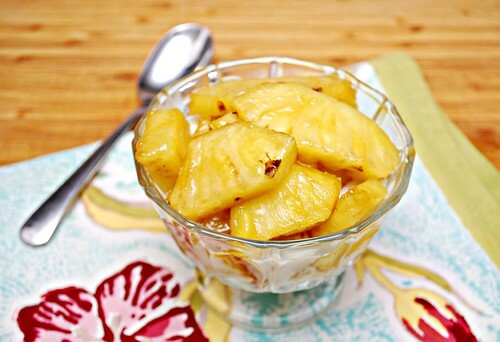 In a medium bowl, combine the brown sugar, pineapple juice, honey, cinnamon and ginger, whisking to combine. Add the pineapple and toss to coat. Spread pineapple mixture in a single layer on a jelly-roll pan lined with foil. Broil 5 minutes or until bubbly. Spoon 1/2 cup yogurt or ice cream into each of 4 dessert bowls. 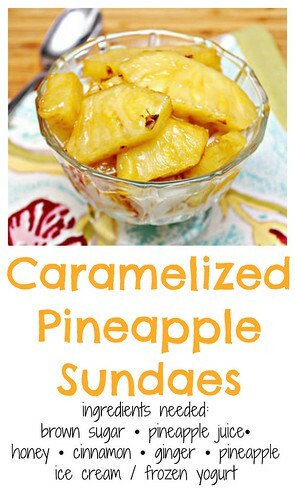 Top each serving with about 1/4 cup pineapple mixture and serve immediately. We love grilling and broiling fruit - this is my kind of recipe! Looks delicious! This totally reminds me of pineapple upside down cake in a sundae glass. It looks and sounds AMAZING!